Sometimes you get the feeling that a filmmaker may never actually have seen a movie before but in this post Tarantino cinephile era, filmdom is filled with individuals who've probably worn out a few remotes in their time. You can add director Jake Goldberger to the latter category of a highly movie literate filmmaker whose debut feature release as a writer/director Don McKay plays like a greatest hits mix-tape of some of American cinema's most influential Film Noirs. Unfortunately for both Goldberger and audiences everywhere, in the case of McKay, this is not exactly a good thing. Essentially the film serves as definite proof that – alarming as it is to buffs everywhere -- there is such a thing as having seen way too many movies, especially when you decide to play homage to all of them in ninety minutes wherein things don't start to fascinate us until the final whirlwind act that goes on for a few twists too many to make any sense whatsoever. And tragically this is compounded with a poorly written DVD box synopsis that actually gives away one of the biggest twists to anyone with a working brain as well as the fact that we must suffer through a pretty deliberate, sedentary and awkward first hour that finds our leads engaging in illogically head-scratching behavior until McKay really tries to kick into Noir high gear. Additionally when you struggle to put all of these broken puzzle pieces together you're left with a sinking feeling of disappointment over a film which, given the obvious intellect and cinema knowledge of its director and a terrific ensemble cast could've been so much better. Heading up a trio of Oscar nominees, the movie stars one of McKay's executive producers in a subtle turn by Thomas Haden Church as a down-on-his-luck janitor who receives a letter from his high school sweetheart, Sonny (Elisabeth Shue) beckoning him to return to the hometown he'd abandoned twenty-five years ago following a tragedy. Traveling home to see her, Church's eponymous lead finds Sonny being tended by Maria (Melissa Leo), a protective live-in nurse and a slightly possessive doctor (James Rebhorn). Dying of an undisclosed illness, Sonny seeks the familiar comfort in the old love of her life and receives it in an ever willing, equally affected yet slightly suspicious Don but when the tender reunion turns tragic with a burst of unexpected violence, the unassuming Don is left wondering just exactly what kind of life he has willingly walked back into in Goldberger's half-baked film. 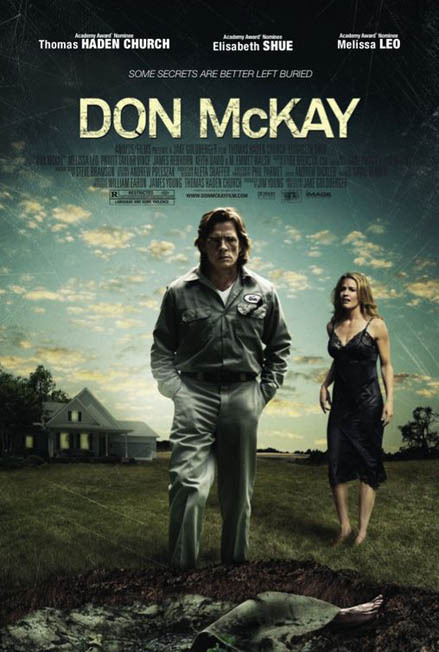 Reminiscent of everything from Vertigo to Blood Simple along with genre classics such as The Postman Always Rings Twice and Double Indemnity, it soon becomes apparent that McKay isn't exactly sure just what movie it wants to be. Thus it meanders from dark hints of absurd comedy to old school “man with a past” meets “woman with a secret” Noir straight out of the 1940s without of course bothering to make sure that everything in the script flows well and/or passes a basic test of what the audience is willing to believe. And just like understanding why the cast would've signed on, it's safe to admit that some filmgoers (who've managed to stay awake for the first two acts) may be initially dazzled by the endless twists being fired at us like bullets dropping on the ground in a you have to see it to believe it stagey kitchen sequence that finds our leads dishing out a new double cross proposition every two seconds. However, once you begin sifting through the new information with which we're presented so quickly that you may have to rewind it to make sure you haven't missed anything in the dubious tongue-twisters that Shue and Leo in particular have made so thrilling, the movie itself begins to fall apart just as rapidly like a house of cards to the point where nothing about the work from the basic premise to the plethora of possible outcomes even begins to add up. A missed opportunity for a film that had so much going for it including that enviable cast of veteran character actors, Don McKay which ends on a strange Kafka meets Coen Brothers final note makes you curious enough to look forward to the filmmaker's sophomore cinematic effort with the sheer hope that next time he'll spend a little less time with his Netflix queue and a little more time double-checking his script for plausibility.